This weekend Steven and I went to a couple different thrift stores in VA and Baltimore. I think the highlight was our first ever trip to a Goodwill outlet store. We only had an hour before they closed, so we were a little overwhelmed and didn’t get too many things. For those of you unfamiliar with the outlets, the clothes and purses are sold per pound. The clothes/handbags were $1.69/pound, but we happened to go on Monday, and at that store Mondays are half off days, score! Next time we go, we are going to allow ourselves a whole day. And just a tip, if you plan on going, you should bring some gloves or at the very least a lot of hand sanitizer. The place is pretty dirty, but definitely worth the digging. 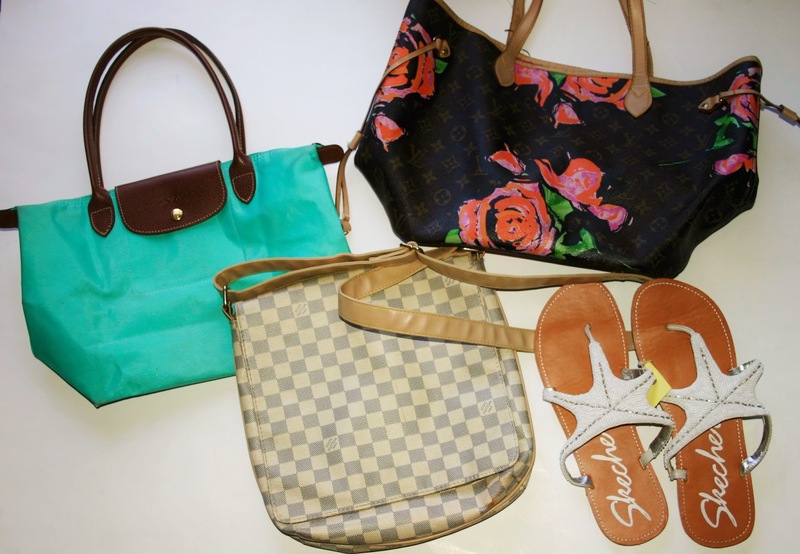 I found two Louis Vuitton bags and a Longchamp bag while we were there, they were under $2 for all of them! The checkered pattern one is almost new and the bigger signature bag is in good shape but the handles need to be re-coated or replaced. I also found my first ever Longchamp bag! Those beaded Skechers starfish I picked up at another thrift store for $4! We had a good little road trip and I found a lot of cute tops for myself and over 20 pairs of jeans to resell. We even received a 40% discount at a Goodwill in Virginia for spending over $100. The thrift stores in Virginia and the Goodwill outlet have been my favorite places to source and shop. The Goodwill around me is pretty mediocre and very overpriced. Hopefully, it won’t be long until we go back to the ones we visited this past weekend! ← Amazon Buyout – $1000 On Shoes!